Esmid Pedraza was charged with murder Friday for the shooting death of his girlfriend, 22-year-old Stacey Aguilar of San Jose, whose body was found in a rural area near Morrison Canyon Road in Fremont last Saturday afternoon, prosecutors said. Hayward police Officer Robert Purnell wrote in a probable cause statement that Pedraza, a 23-year-old man from unincorporated Hayward, shot Aguilar after they attended a party with Donato Perez, a friend of Pedraza’s, at 24073 Silva Ave. in Hayward the night of Feb. 13. Purnell said Perez, a 23-year-old Oakland man, told police that Pedraza was armed with a handgun and went out to his car with Aguilar outside the party at about 1 a.m. on Feb. 14. Perez, according to Purnell, said he heard several gunshots and went out to Pedraza’s car, where Pedraza was holding a gun and admitted that he had shot and killed Aguilar. Pedraza and Perez then allegedly drove Aguilar’s body to Morrison Canyon Road in Fremont, where they rolled it down the hillside. Purnell said Alameda County sheriff’s deputies contacted Pedraza on Feb. 16 after Aguilar’s sisters reported her missing and found blood on his car. Pedraza was arrested at that time for domestic violence and subsequent searches and video surveillance corroborated the evidence that Perez provided about Pedraza’s involvement in the crime, Purnell said. Hayward police took Pedraza into custody on a murder warrant for Aguilar’s death at 1:10 p.m. on Wednesday at 630 Sansome St. in San Francisco, where he was being held in federal custody on an immigration hold, Purnell said. Perez, who was arrested at his home in the 1600 block of 68th Avenue in East Oakland at 8:40 a.m. on Thursday, admitted to police that in addition to helping Pedraza dispose of Aguilar’s body he also helped dispose of her belongings, including her identification card, credit card and cellphone, according to Purnell. Perez also admitted that he helped clean off Pedraza’s car, which contained Aguilar’s blood, Purnell said. Surveillance video at a car wash corroborated Perez’s admission, Purnell said. In addition to murder, Pedraza is charged with causing Aguilar’s death by firing a gun, an enhancement clause that could add 25 years to his sentence if he’s convicted of murder. Perez is charged with being an accessory after the fact. 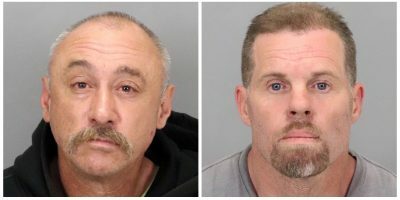 Pedraza, who’s being held in custody without bail, and Perez, who’s being held in lieu of $20,000 bail, were scheduled to be arraigned in Alameda County Superior Court this afternoon. Earlier today, U.S. Immigration and Customs Enforcement officials said they wanted to take Pedraza into custody if he wasn’t charged in connection with Aguilar’s death. In a statement, the agency said, “ICE has lodged a formal request with the Alameda County Jail seeking to have the jail notify ICE prior to Mr.